Digital Projections launched earlier today. 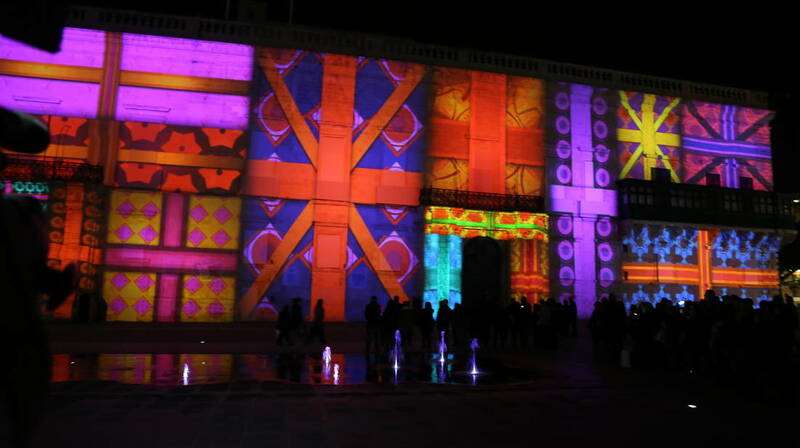 The annual Christmas Digital Projections have once again lit up the façade of the Grandmaster’s Palace at Pjazza San Ġorġ for the festive season. The projections were launched by Her Excellency the President of Malta Marie-Louise Coleiro Preca together with Valletta 2018 Chairman Jason Micallef and Parliamentary Secretary for Consumer Protection and Valletta 2018 Deo Debattista. Valletta 2018 has teamed up with the MCAST Institute of Creative Arts third year students from BA Interactive Media, Graphic Design and Game Arts to develop the yearly projection. Apart from students from three courses, the production team this year have also worked closely with both Valletta 2018 and the Mad About Video team. The projections are on at Pjazza San Ġorġ on the 22nd-30th December, starting at 6pm and running every 30 minutes till 11pm. A final show is also scheduled for the 31st December to usher in the New Year as part of the national New Year’s Eve festivities in Valletta. The annual Christmas Digital Projections have once again lit up the façade of the Grandmaster’s Palace at Pjazza San Ġorġ for the festive season. The projections were launched by Her Excellency the President of Malta Marie-Louise Coleiro Preca together with Valletta 2018 Chairman Jason Micallef.